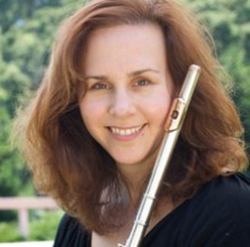 Amy Likar is a member of the Oakland East Bay Symphony, a part of East Bay Performing Arts. She teaches woodwinds for EBPA’s Music For Excellence (MUSE) program and coaches for the Oakland Youth Orchestra and the Berkeley Youth Orchestra. As a freelance musician, she has performed with numerous groups throughout the Bay Area of California. A lover of chamber music, Amy performs in the Alcyone Ensemble with flutist Rena Urso-Trapani and Ciel, Aer et Vens with soprano Jenni Cook. Both groups often collaborate with pianist, Miles Graber. She holds Master of Music and Doctor of Musical Arts degrees from The Ohio State University and a Bachelor’s in Music Education and Flute Performance from Kent State University. Her flute teachers include Martha Aarons and Katherine Borst Jones. As a licensed Andover Educator, Amy has presented Body Mapping workshops and master classes throughout the United States and Europe. She is Director of Training for Andover Educators and served as the president of the organization for 7 years and was instrumental turning the organization into a non profit for professional development and continuing education for musicians and music educators. She enjoys working with all levels of musicians as they work to achieve their personal and musical goals. Amy has studied the Alexander Technique for over 20 years and received her teaching certification and training from the Alexander Training Institute of San Francisco, studying with Frank Ottiwell, Robert Britton, Larry Ball, Rome Earle, Simone Biase and John Coffin. She has also studied the Alexander Technique and Body Mapping over the past 20 years with Barbara Conable. She is a member of the American Society of the Alexander Technique (M.AmSAT) and Alexander Technique International. Amy’s goals are to continue performing, teaching and writing to build community through music so that future generations of musicians can enjoy the art form she loves so much.